But then I knew that already. I went to the flower shop I was referred to at the tasting a couple weeks ago today to get a quote. When I originally did my budget way back when I was still searching for a venue I used $700 as my figure. Since then, I had dropped it down to $350 after running some numbers and taking into account the anticipated number in our bridal party and the fact that I will not be using flowers to decorate the venue or as centerpieces. I would love to have flowers for centerpieces but I simply do not want to spend the money that it would cost to do it. My centerpieces will be DIY and each have one pink floating carnation. There is a beautiful elegant white arch with multiple columns at the ceremony location set against a wall of greenery that will be in full bloom with flowers in July so I have decided to leave well enough alone. I will only be dressing the arch in tulle that costs $100 from the hotel. I feel just a little bit indulgent and excessive at the thought of carrying a $110 bouquet. I mean, do I really need a prop that expensive? One I will carry down the aisle then toss over my shoulder and send home with someone else. I did not order a "throw away" bouquet. I was hoping for $80 and do not feel that I have requested anything too elaborate. I don't like cascading. Good thing because they cost even more. 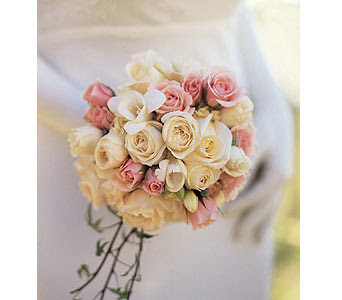 I chose a round bouquet with all light pink roses and baby's breath throughout which I love. It will have some ivy around the edges for finish and a white satin ribbon around the stalks with white pearls running down it. And that's all folks. The range she gave me for the bouquet was $110-$140 so of course I asked for the lower end. However many roses $110 will get me should be enough. The attendant bouquets have a lot more greenery and a few different kinds of flowers in it with names I can't remember, including Carnations in different shades of pink and will be tied with a black ribbon. One benefit of having a smaller bridal party-less flower expenses. I didn't originally think about all of the extra corsages and boutonniere's for the mom's, dad's and officiant/friend but I want each of them to have one and as with everything else it just adds up. The thought has crossed my mind to try to do DIY some of it. I don't know if I am ambitious enough to do it all myself but if I throw the attendant bouquet's together myself I'm pretty sure I could do it for less then $160. I have a co worker who does flowers on the side as a hobby. I might be able to have her do all bouquet's and then I would only have to order the boutonniere's and corsages from Allen's which might save me money if she could do it for less then the $270 quoted. Fifty Flowers.com has some DIY Wedding combos I could play around with. I have also found some reasonable priced wholesale flowers online at Growers Box and Blooms By The Box but I will ONLY pursue this route if it will save me significantly more money otherwise I might as well save myself the time and worry and just leave it to the professionals. We shall see. Either way I am still under my original budget and overall $428 for bridal party/parent flowers doesn't seem to be all that bad considering what it could be. I am really happy with my selections. The lady who helped me didn't seem pushy and it was not some high end boutique shop. After browsing online I think the prices are reasonably low and competitive. It's so crazy how expensive everything is, isn't it? Sounds like you're doing great with your budget though! Have you chosen your colors yet? My colors are PINK of course and Black. And yes I am trying to faithfully stick to the budget.